Last year I was studying at Pakenham Secondary College. My Dad heard about it on the radio while at work and called me and told me about it. I looked it up and it looked so interesting so I applied for the school. I thought the first information night was great because Alex explained everything that was going on at the school, I had no questions at the end of the night because he said everything I needed to know. I found the application form easy to fill out and easy to understand, the interview was good because it gave me practice in interview skills. Both of my parents was on board from the begin because they know how much I love football. 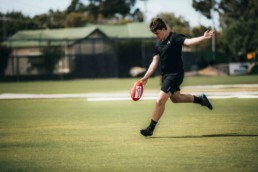 At normal high schools an AFL legend doesn’t normally come in and teach us footy skills. My first term was different to my other school, because I was catching a train every day, meeting new people and in a different type of learning space. 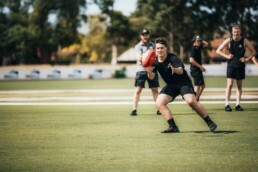 It’s different because at normal high schools an AFL legend doesn’t normally come in and teach us footy skills, it’s great that he gets to share his football experience and what it’s like to be an AFL player. The best thing about attending The Academy is that its in an AFL environment and we learn more about our abilities. I’m hoping at the end of my studies, I get into an AFL club. If not, a physiotherapist at any club in the AFL. If I could meet any famous person it would Royce Hart because he is one of Richmond greatest ever players. I love the way he plays football and I reckon it would be great to sit down and talk about football, what it was like playing back then, what made him choose to play football, who inspired him to play football. My biggest supporter is my Mum and Dad, they have always been there when I’m playing football. When I need help with footy, Dad gives me tips to play better, he inspires me to play my best every game that he is there. When I’m not living and breathing footy, I go to the bush ( Dargo ) with the family to ride dirt bikes with my brother and to sit back and and relax by the fire at night, spending time with family.